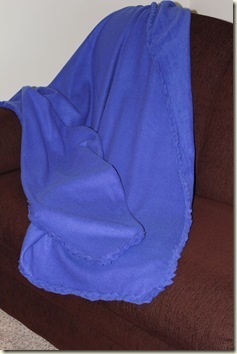 You can't go wrong with a fleece throw that is easy to make, light-weight, warm and washable. This no-sew fleece blanket is perfect for keeping warm while relaxing on the sofa or your favorite chair. All you need to make this throw is anti-pill fleece, cutting mat, rotary cutter and painter's tape. Make personalized fleece throws for family members and friends by choosing certain prints and colors, such as a favorite football team. It only takes a small amount of time and money to make a throw using this easy to follow blanket pattern.